Nodular melanoma is a particularly lethal form of cancer that disregards the ABCDE guidelines that are so publicized about melanoma. Delayed diagnosis is more common with nodular melanoma than with the more common superficial spreading type. What’s frightening about nodular melanoma is that it can also mimic benign conditions like common blemishes. 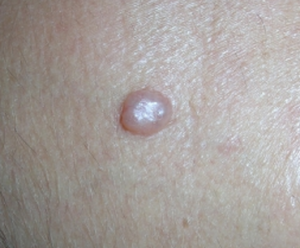 A person at home may notice a nodule and not even think it could be melanoma. The nodular type grows more in depth than it does laterally – which is why it’s more fatal than the flat type of tumors that grow more in diameter. Depth of the tumor is predictive of survival rates. “Nodular melanomas represent 15-30% of all melanomas,” says Hadley King, MD, a board certified dermatologist who specializes in medical and cosmetic dermatology. For example, the “D,” which stands for diameter, is often referenced to that of a pencil eraser (6 mm) as a suspicious sign. But a stage 2 nodular melanoma may only be 2 mm. The “A” stands for asymmetry, but a nodular melanoma may be symmetrical in that an imaginary line down the middle results in two even-looking sides. Its border isn’t necessarily erratic or jagged, either. It can appear closer to smooth than to ragged. Dr. King explains, “They tend to appear as a growth that sticks out from the skin and looks like a bump. “It is usually black — but may be blue, gray, white, brown, tan, red or the same color as the surrounding skin. Nodular melanoma can mimic a pimple or blemish and appear anywhere on the face, ears or anywhere else on the body. “The often unremarkable clinical presentation necessitates physicians and patients to be wary of new or changing skin lesions,” says Dr. King. 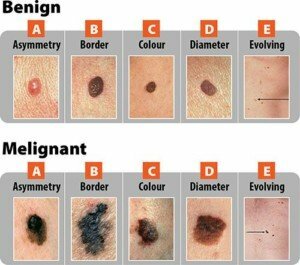 Self-skin exams should not be fixed only on moles. Every mole should be inspected every month, but people also need to be perceptive of NEW lesions forming on the skin. 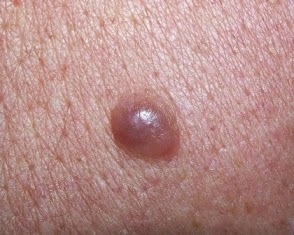 A nodular melanoma is less likely than the superficial spreading type to start growing in a pre-existing mole. This is why all areas of the skin should be examined every month. The skin gets new bumps, spots and blemish-like things all the time. For instance, an inverted hair or inflamed follicle will cause a tiny bump. If this is located in an area that a person cannot view up close, such as the front of a forearm, the little bump can cause worry. A new, tiny bump can also be a scab. But if it’s on the back or some other difficult-to-inspect area, the patient will wonder what this is. This threshold for concern is very important, because a nodular melanoma, by definition, starts out as a tiny bump or raised spot. Any new bump, spot or patch that doesn’t go away after a few weeks should be examined by a doctor. How Fast Can Melanoma Change Visibly to Naked Eye? How Fast Can Melanoma Spread After It First Appears? 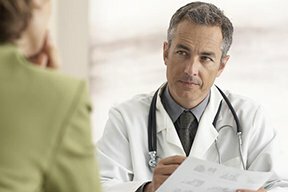 Do ABCDEs Always Apply to Melanoma; Can Cancer Look Normal?